It is one thing to make your art and enjoy the finished product. It is an entirely different experience to celebrate your work and make an active choice to put it on display to showcase your time and effort. This weekend I’m watching students put together their own celebration. After two years of working towards a body of art, my senior students are about to exhibit their show: Unlocked. We transform our auditorium into a gallery space to celebrate the culmination of their efforts, as well as to create a space for their exam, which is an interview with an outside examiner. Students design the theme of the show and put together a gallery pamphlet with individual artist statements. We enlist the help of our school support staff who build, paint and repair our display boards. They also help with the physical labor of installing our displays in the auditorium and come in handy when we need a drill. At the end students touch up work, put out labels and create price lists for the sale of their work. 20% of all sales goes to a school sponsored charity. We are currently deciding between MSF (called Doctors without Borders in the USA) or Raila Educational Centre, a school located in Kibera, a large slum in Kenya. I wish I could express to you the sense of pride students feel on opening night. When all of their work is framed and on formal display, they experience their art in a whole new light (it looks a bit different when it isn’t in a paint-filled, scrap-paper ridden art room!). So many times we practicing artists do not take the time to celebrate our efforts and we can easily lose sight of all of the artwork we have made. Yes, a formal, established gallery venue is a wonderful way to do this but unless you have gallery representation or pocket money to spare the frequency of this opportunity may be quite limited. However, one can celebrate with family and friends without spending loads of money. 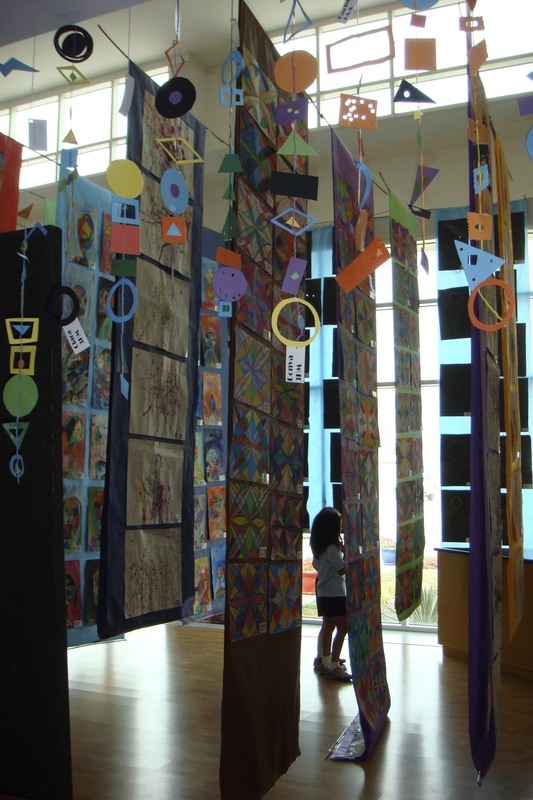 created display for elementary art students… there are ways to make space! I’ve seen homes in Dubai transformed into gallery spaces in tasteful, celebratory ways. Why not use the wall space in your own home to put up and celebrate your recent efforts? Make some finger foods and have loved ones help out by BYO… whatever. Throw a party! Not only can you celebrate your hard work with people that matter but also share your art with them. I’m not always good at sharing my work when I’m done and I wonder if my family knows about all of the work I’ve made! And who knows, maybe friends will bring friends and artwork will be purchased or commissioned. I know my students are excited and anxious to celebrate their work, shouldn’t you be? BE COURAGEOUSLY CREATIVE: Can you conceive of a display space for a periodic celebration and showcasing of your work? What is one step you can take right now to help realize this?